It's always a fabulous experience to be able to taste aged wines and really analyze how they have changed over the years. Not only is it fun to see how the wine itself has changed in the bottle, but it's also fun to reflect upon the changes the winery has gone through over the years as well. 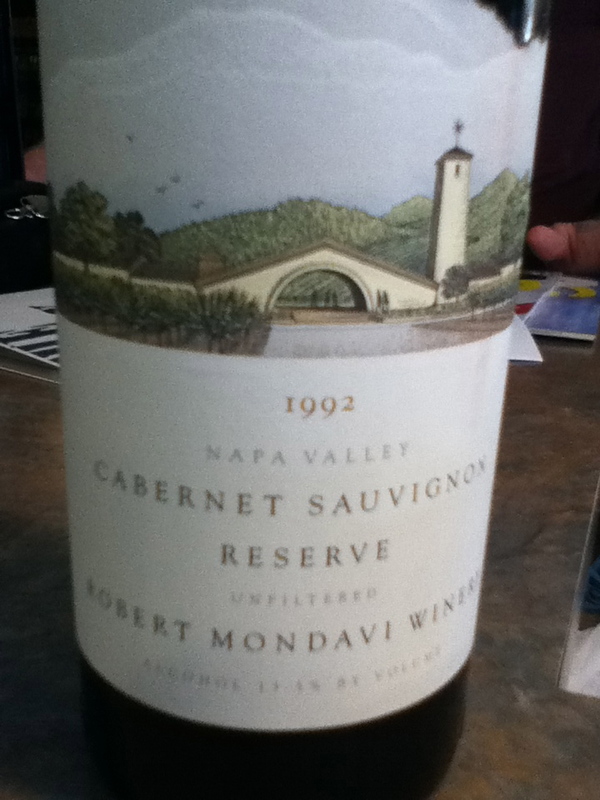 This particular bottle of wine is quite interesting to taste because of what Mondavi means to the American wine industry, and because in 1992 the late Mr. Mondavi actually still owned the winery. So......it's like tasting a true piece of history. On the nose I get aromas of stewed cherry, dusty coco powder, peppercorn, plum, earth, tobacco, and a touch of mushroom. It's a bouquet that develops dramatically in the glass and opens up to reveal several layers beyond the initial impressions. The wine is distinctively Mondavi Reserve with it's peppercorn, coco, cherry, and earthy tones. This is definitely made in the "old world" style that once defined the Mondavi Cabernet's of the early 90's and back through the 70's and 80's. I mean it's only 13.5% alcohol for Christ's sake.....(which I love).